Nepal, Can’t We Be Friends Again? Just days ago, on November 13th, Telegraph Nepal reported a rather alarming statement from a spokesperson of Nepal’s Home Ministry. Sudhir Kumar Sah warned that Nepal cannot tolerate the anti-China activities and that “this will lead to a situation where the government may have to slash all the facilities being granted to the Tibetans residing in Nepal, such as that of their freedom to move even.” He added that Tibetan businesses may be shut down as well. Nepal is not a signatory to 1951 UN Refugee Convention and has no domestic legislation on refugees, so it seems this policy change is not outside the realm of possibility. Tibetans in Nepal already have no defined legal status – only those who arrived before 1989 are allowed to remain, though without the rights of citizens (ie. driver’s license, property or business ownership, access to certain educational institutions or careers). So taking away more rights of stateless Tibetans may not be so difficult. But how serious is this threat? And can we determine this by asking what has caused this latest development? Let’s turn now to another shocking, though positive, statement that was made recently regarding Tibetans in Nepal. 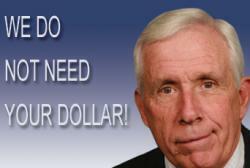 On November 3rd, Frank Wolf, a US lawmaker, stated that if Nepal doesn’t grant Tibetan refugees exit visas to the US, he would block all US aid to the nation. “We’re not just going to cut them, we’re going to zero them out.” He was speaking before a congressional hearing where Prime Minister of the Tibetan Government in Exile, Lobsang Sangye, testified on the crisis inside Tibet. Could it be that the Nepal Home Ministry’s remarks are a response to Wolf’s statement? Referring to the substantial aid that the US gives Nepal, Wolf (who sits on the House Appropriations Committee which determines US funding) said the cuts would come if he didn’t seen an improvement in Nepal’s treatment of Tibetan refugees by next year. “If they’re not willing to do it, then they don’t share our values and if they don’t share our values, we do not want to share our dollars.” This was no small threat since USAID sought out $57.7 million for Nepal in 2010 alone. Similarly, on radio talk shows and online comments sections of articles like the one above, ordinary Nepalese people expressed a similar anger with what they perceived as US bullying. Rather than reflecting on the issue of how Tibetans are treated, they compare Wolf’s words to what they saw as US interference in Iraq and Afghanistan. Whereas China, they felt, provided funding to Nepal without trying to control how Nepal was governed. Awareness among Nepalese people of their precarious position as a small, impoverished nation sandwiched between two global powers is acute. As such, this notion of China as a benevolent, generous friend who has no interest in dictating Nepal’s affairs is an attractive one. His words reflect China’s old refrain against other nations intruding on their own internal affairs: Tibet. But meanwhile, what pressure the Chinese do apply on Nepal is primarily concerning the Tibetan refugee population – an internal affair of Nepal’s by any measure. Nepal and China are in fact engaged in a barter system: China wants Tibetans repressed and Nepal wants aid for this service. Meanwhile, the US wants to relocate Tibetan refugees to the states, however Nepal cannot let this happen – what would they sell to China in exchange for funds then? On November 7th, just days after Wolf’s threat and amidst protests in Nepal, Liu Qi, a senior politburo member of the CCP lodged a former complaint about Tibetan protests in Nepal with Nepal’s Prime Minister Baburam Bhattarai during a diplomatic visit to Kathmandu. Unlike the US, China has no reservations expressing their official position on Tibet, but they do it in a way that does not appear to instigate Nepal’s insecurities about its sovereignty. 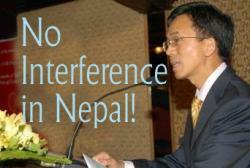 If Thapa is right and such drastic actions by the US are unlikely, what is the end effect of this kind of statement? Does it only bring the Nepalese lay closer to the Chinese and further from the Tibetan refugees who are their neighbors? What would be more effective than threatening the suspension of aid from the US? I want to suggest that the US can help Tibetans more through being an ally and a donor to Nepal, rather than threatening disengagement. The US (if it means to counteract China’s prowess in Nepal) must actually increase its influence by becoming a bigger presence – through more aid, diplomatic interaction and intellectual exchanges through roundtables. There are Nepalese people in every sector of the economy who support Tibetans however. I’ve met with journalists, writers, human rights workers, and even an army commandant, who’ve not only expressed support but some of whom have even highlighted the issue of Tibetans in their work. Not to mention the fact that in all my years living in or visiting Nepal have I ever felt discriminated by ordinary Nepalese people. Nepal and Tibet’s borders bleed into each other; our peoples meld and share the same gods and temples. Support in Nepal exists; we have to encourage it to come out. Thapa continued, “Why would a nation such as ours for whom freedom of speech, democracy, and sovereignty have been a constant struggle, even contemplate denying the same rights to another cohort?” This is the question that all Nepalese must ask if we are to change the situation for Tibetan refugees. I don’t mean to suggest that Representative Wolf’s statement was a mistake. Beyond the short-term negative reaction of the Nepalese politicians and lay, it’s certain that his words caused many to step back and give pause to the situation of Tibetan refugees in Nepal. We don’t know the long-term impact yet of this statement. What I mean is that this in itself is not the primary strategy to pursue for the benefit of Tibetans in Nepal. It has just been announced that Chinese Prime Minister Wen Jiabao will make a two-day diplomatic visit to Nepal starting December 20. 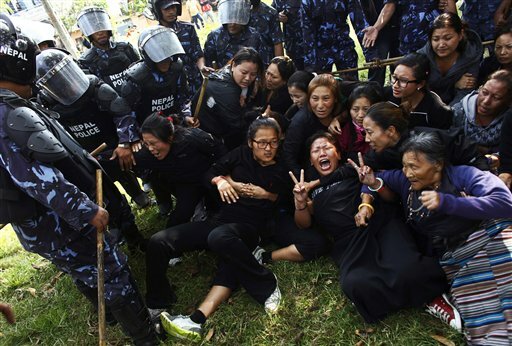 This means that Nepali repression of Tibetans will likely intensify before it calms. How will politicians in Western nations react to this? Can we pressure Nepal without alienating the people and the government? Can we remind them of our mutual interests?